Julia is a Home Care Business Nurse Consultant and Coach, Entrepreneur, Success Coach, Author and Real Estate Investor. She has been in the health care field for 15 years. Julia’s journey first started off in high school when she became a Certified Nurse Assistant. Then in her senior year in high school, she was chosen to participate in a bridge program to become a Licensed Practical Nurse. After high school, she worked as an LPN while obtaining her BSN at Syracuse University in New York. During her schooling, Julia fell in love with her Community Health Nursing Clinical and knew she wanted to make this area her specialty. She loved the impact that Nurses in the community had on patients who had no or little access to health care in the rural upstate NY area. She was intrigued by the difference Nurse’s made in patients’ lives. She then graduated and started her Nursing Career at Mount Sinai Hospital in New York. She worked on a medical surgical telemetry unit to ensure she gained a solid foundation in clinical Nursing. 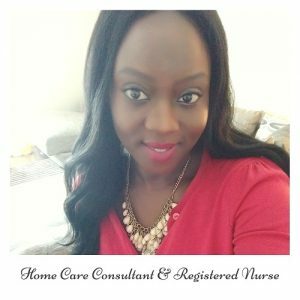 After a while, Julia entered into her career in Community Health Nursing by accepting her first home care job offer as a Case Manager in a Certified Home Care Agency. There she learned the fundamentals of Public Health Nursing and Medicare/Medicaid. It didn’t take her long before she climbed the corporate ladder in management. Julia served as a RN Director of Patient Services in New York City for several years. There she acquired skills that included, Leadership, Organizational Development, Implementation, Administrative skills, Business Strategy/Marketing, Policy and Procedure Development, Interpreting Home Care Regulations, dealing with Patient Complaints and gaining Professional Development. Julia furthered her experience with insurance companies, Certified Home Health Agencies, Licensed Medical and Non- Medical Agencies, Medicaid, and Private Pay. She started 3 home care agencies during this time from start to finish. While working fulltime, she then received her Master’s in Nursing Education to help her with managing, teaching, and leadership. After working long hours and being continuously on call, Julia decided she would use her expertise to serve as a Home Care Consultant in the NY area. She left her full-time job and there Emmanuel Consulting was born. 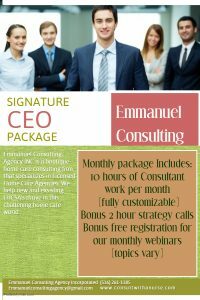 Julia has been the Chief Executive Officer of Emmanuel Consulting Agency Incorporated since 2014 and has 3 Home Care Consultants that aide her in providing expert Consulting to the NY, NJ, PA area. Since then the company has grown and currently provides consulting to various parts of the United States. Her company specializes in start- ups and existing home care agencies and provides a host of services to ensure home care agencies thrive. Julia is also a serial Entrepreneur and Mentor, she loves to Coach other mompreneurs to inspire and grow their businesses and is often referred to by her Coaching clients as Coach Jewelz “The Success Coach”. She loves writing and is the author of “20 Ways to Get Work Life Balance in 2018” a book to help mothers live a more organized balanced life, while doing the things they love. She also invests in real estate and loves to take on real estate projects. In her spare time, Julia enjoys self-care including spas, retreats, culinary and travel. One of her favorite places to travel to is Costa Rica where she enjoys the fabulous scenic rain forest views. Julia hopes to continue to inspire women to own and grow businesses and to push through the challenges that come with entrepreneurship. Julia’s mission in the next few years is to do more traveling and encourage other women entrepreneurs across other parts of the country.